Kinsaiyok, Brankassi, Hindaine, Hindato, Non Pladuk, Nacompaton, Bangkok (go downs), Motor Transport Camp Bangkok, Bangkok Racecourse 7 days, Bangkok University Camp. Peter Gardiner was wounded on 8/2/1942, spent 3 days behind enemy lines before being evacuated to hospital. NCO rejoined unit in the line at Holland Village Cemetery, Buona Vista on 15/2/1942. NCO was half brother to WX15905 E.G. Moir (Ted) who died at Kuii Camp, Thailand. Peter Gardiner and Ted Moir (Edward George) WX15905 are half brothers. Ted Moir died of malaria and dysentery at Kuii, October 1943. BANGKOK, THAILAND. 1945-09-15. 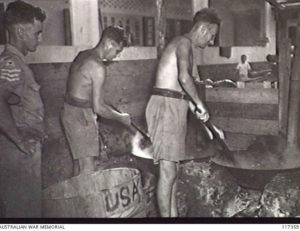 COOKS PREPARING THE EVENING MEAL AT THE PRISONER OF WAR (POW) BRANCH HEADQUARTERS, RECOVERED ALLIED POW AND INTERNEES UNIT TRANSIT CAMP FOR 8TH AUSTRALIAN DIVISION, EX-POWS OF THE JAPANESE AWAITING TRANSPORT BACK HOME TO AUSTRALIA. SHOWN: SERGEANT P. A. GARDINER, 2/4TH MACHINE GUN BATTALION (1); PRIVATE (PTE) J. W. BASELL, 2/4TH MACHINE GUN BATTALION (2); PTE A. RUMBLE, 2/2ND PIONEER BATTALION (3). Edward (Ted) Moir’s father McLaren John (known as Kenny) Moir enlisted 1916 AIF WW1, 44th Btn. Whilst at Blackboy Hill, Kenny Moir contracted pneumonia and soon after in 1916 at hospital in Subiaco. Widow Edith Alice was left alone with two young children to raise, Gwen and Ted. Edith Alice Moir (nee Parsons) remarried in to Harold Alan Gardiner. Their son Peter Alan Gardiner WX 10925 was born in 1921, he enlisted 17 February 1941. Peter’s father Harold Alan Gardiner WX17894 born 10 Sep 1905 enlisted and with 2/11th Btn was taken POW of Germany whilst fighting in Crete. He died in Cranbrook 25 January 1961. Edith Alice (Parsons) Gardiner died 1983 aged 93 years. Edward (Ted) Moir enlisted September 1941. Tragically Ted Moir died of Malaria and dysentery at Kuii 1943. Peter Gardiner enlisted 6 months earlier than Ted on 22 March 1941 joining ‘D’ Company – Ted Moir also joined ‘D’ Coy and after capitulation at Singapore both were selected to work on the Burma Thai Railway with ‘D’ Force, V Battalion. V Battalion was to endure the highest loss of life of any group on the Railway and the most horrific conditions. Please read about ‘D’ Force V Battalion. Peter would have been devastated with the death of Ted Moir at Kuii knowing his brother was father to three children. It was said of Peter “he was one of nature’s gentlemen’. On his return home Peter married in 1948 to Helene Kalafatas. Helene remarried in 1959. It appears Peter Gardiner never remarried and in the 1972 Electoral Roll his mother was residing with him. The 1977 and 1980 Electoral Roll records Peter working as a Rep and living in Woodlands. He died 8 May 1986 at Woodlands and cremated at Pinaroo. He was 66 years old.